An active report using Adobe® Flex® includes most of the capabilities available in the HTML version of active reports in a user-friendly report format. An active report delivered as a self-contained Adobe Flash file (.SWF files that are Adobe® Flash® Player compatible) allows for faster analysis of large data sets and interaction with the active report. With InfoAssist open in Report view, on the Format tab, in the Output Types group, click active report. The following image shows an active report with the available menu options for the Product Category column. Menu options for an active report are described in the following table. Sorts the column in ascending order. Sorts the column in descending order. Creates a chart from the report. Options are Pie, Line, Bar, and Scatter. Lists the fields available to create a Rollup table. Lists the fields available to create a Pivot table. Adds or removes visualization bars to the selected column. The Visualize option is available for numeric data columns. Suppresses the display of the selected column in the report. Lists the names of the columns that are hidden in the report, allowing you to individually restore a column. Select the name of a specific column in the hidden columns list to restore that column to the report. Freezes the report at a particular point so that columns to the left of the freeze point remain in view while the user scrolls through the other report columns. Note: If the report can be fully viewed in the browser window, freeze is not applied. The Freeze column option is not available for expandable report (Accordion) views. Opens the Grid Tool which you can use to change the column order, select multiple columns to sort ascending or descending, hide and show columns, add a calculation result to a column, and add subtotals in the active report. Opens the Chart/Rollup Tool which you can use to select multiple group fields to generate the chart or rollup table. The Chart/Rollup Tool contains a list of columns available in the active report to add to Group By and Measure fields. Drag the columns into the field that you want. Opens the Pivot Tool, which you can use to select multiple group fields to generate the chart or pivot table. The Pivot Tool contains a list of columns available in the active report to add to Group By, Across, and Measure fields. Drag the columns into the field that you want. Opens the Show Records menu option to list the number of records available for display per page in the report. Select a number (for example, 10) to display, per page. Default displays the number of records (lines) per page that is specified in the WebFOCUS report procedure. Options to display comments under cells or hide indicators for comments in the active report output. Note: To use this feature, you must have ActiveX enabled in your browser security settings. This feature is only supported in Internet Explorer. Exports all records or filtered only records to HTML, CSV, or XML. Prints all records or filtered only records. Displays reports in a cascade or separate tabs. Restores the active report to its default state specified in the report procedure. 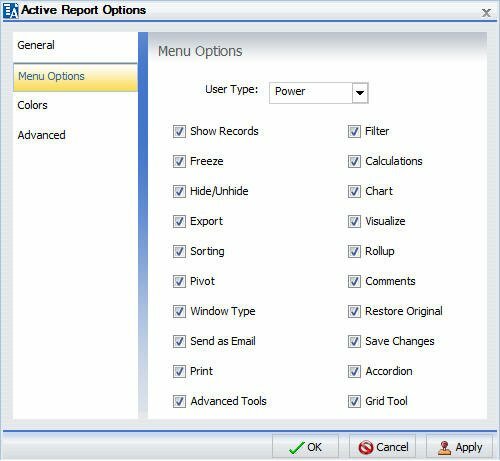 You can configure active report options, including menu options, based on user role through the active report options dialog box. You access the dialog box on the Format tab, in the Features group, by clicking the active report options button. The button is available when active report, active Flash, or active PDF is selected as the output type. Use the General tab to set common properties specific to active reports. The General tab is shown in the following image. Display. This area contains options to set the window to cascade or tabs, and options to freeze columns. Window. Select the window setting. The options are Cascade and Tabs. Freeze Columns. Select the columns you would like to freeze. You can also select None. Page Options. This area contains options to set the number of records per page, enable the display of page information, edit the alignment, and set the location of the page information. Display Page Information. Select this option to display page information. Clear this option to disable the display of page information. Alignment. Click the appropriate button to set the alignment of the page information. Options are Left, Center, and Right. Location. Select the location for the page information. The options are Top Row and Bottom Row. Chart Options. This area contains options that pertain to charts. Standard. Uses the Active Technologies default chart engine. This option is available for output format types AHTML, FLEX, and APDF. Flex. Uses the default four Adobe Flex charts when output format is FLEX or APDF. These are the existing charts that work in both connected and disconnected mode. No additional chart types will be available at run time. Legend (check box). Select this option to collapse the legend if necessary. Clear this option if you do not want the legend to collapse. This is for active Flash and active PDF only. Use the Menu Options tab to select a user type and select which options to display in the menu. The Menu Options tab is shown in the following image. User Type. The options are Power, Analyst, Basic, and Custom. Power. This is the default user type and enables all functionality. Analyst. This user type has the following functionality: Show Records, Freeze, Hide/Unhide, Export, Sorting, Pivot, Filter, Calculations, Chart, Visualize, Restore Original, Save Changes, and Accordion. Basic. This user type has the following functionality: Show Records, Freeze, Hide/Unhide, Sorting, Filter, Calculations, Visualize, and Restore Original. Custom. If you select a combination of options that does not match one of the existing user types (Power, Analyst, Basic), the User level name that appears in the User Type field is Custom. This is not a default user type or a selectable user type. It is used to show that options for this user do not match any of the existing user types. Show Records. Shows all records or specific numbers of records. Freeze. Freezes and unfreezes columns. Hide/Unhide. Hides and shows columns. Export. Exports data as HTML, .CSV, or Excel (XML) formats. Sorting. Sorts data in ascending and descending order. Window Type. Shows windows as cascade or tabs. Send as Email. Sends reports as email. Print. Prints all records or filtered-only records. Advanced Tools. Accesses the Chart/Rollup, Pivot, and Grid Tools. Filter. Opens the Filter Selection dialog box. Calculations. Performs the following calculations: Sum, Avg, Min, Max, Count, Distinct, % of Total. Chart. Converts report to pie, line, bar, or scatter charts. Visualize. Adds data visualization bars to report. Rollup. Performs rollup on data. Restore Original. Restores original data. Grid Tool. Opens the Grid Tool dialog box. Use the Colors tab to select colors for various objects on the report. The Colors tab is shown in the following image. Page. This area contains options to set the colors for the font and background for the page text. Font. Opens the Color dialog box, where you can select the font color. Background. Opens the Color dialog box, where you can select the background color for the page text. Row Selection. 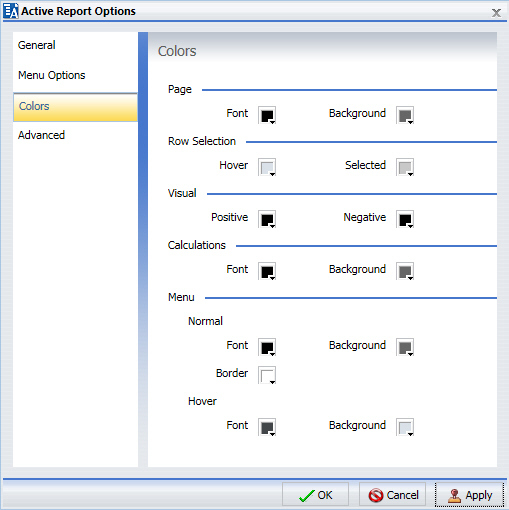 This area contains options to set the colors that appear when you point to or select a row on the report. Hover. Opens the Color dialog box, where you can select the color that the row becomes when you hold the mouse over the row. Selected. Opens the Color dialog box, where you can select the highlight color that the row becomes when you use the highlight option. Visual. This area contains options to set the colors for the data visualization bars. Positive. Opens the Color dialog box, where you can select the color for a positive data visualization bar. Negative. Opens the Color dialog box, where you can select the color for a negative data visualization bar. Calculations. This area contains options to set the colors for values in a calculation. Font. Opens the Color dialog box, where you can select the font color for the calculation. Background. Opens the Color dialog box, where you can select the background color for the calculation. Menu. This area contains options to change the color of the menu. Font. Opens the Color dialog box, where you can select the color for the text of the options on the column menus. Background. Opens the Color dialog box, where you can select the background color for the column menus. Border. Opens the Color dialog box, where you can select the color for the border of the column menus. Font. Opens the Color dialog box, where you can select the color for the text of the options on the column menus when you point to them. Background. Opens the Color dialog box, where you can select the background color that appears behind options on the column menus when you point to them. 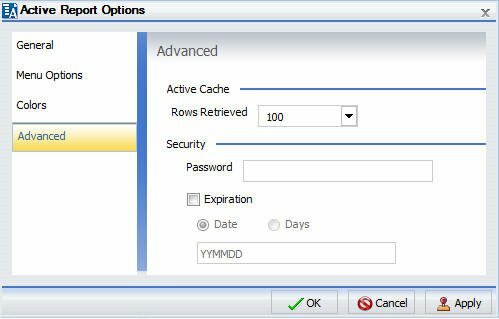 Use the Advanced tab to control the number of rows retrieved from active cache and to make security settings. Note: active cache is enabled when you select active report as the output type on the Format tab, in the Output Types group, and click Pages on Demand on the Format tab, in the Navigation group. The Advanced tab is shown in the following image. active cache. Enables reports to cache the data in a binary file and return the data to the output window in pre-set increments. Security. This area allows you to set a password to access the report and enable expiration by date or by days. Note: When setting security options for active reports, be aware that security options can be set for each individual component on the canvas, but only one password can be set for the entire document.